Automatic doors offer convenient access and help prevent injury to customers by waiting to open or close until the customer has completely passed through the doorway. This is especially helpful when it comes to areas of slower-moving traffic. 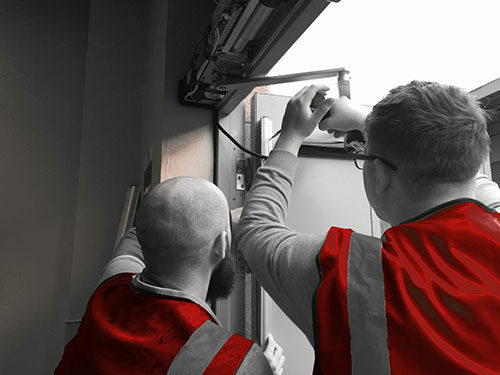 Entrance Access Solutions (EAS) offer installation, replacement and repair services for all types of automatic doors in the Glasgow, Edinburgh and Central Belt region as well as the whole of Scotland. Entrance Access Solutions (EAS) offer the installation of any of your entrance requirements or needs. From the retrospective install of an automatic operator to an existing door to complete glazed architectural aluminium shop front with automatic entrance doors. The team pride themselves on their ability to take you from initial contact through bespoke design, manufacture and installation, always ensuring that the project is completed to the highest of standard and most importantly suited to the environment and customer needs. When you engage with Entrance Access Solutions, you benefit from years of experience, as well as the knowledge needed to ensure your doors are safe to use by your visitors. We can give you the peace of mind that you need and deserve. With our team of mobile engineers carrying a stock of replacement parts, we're able to fix many automatic door problems during our first visit. The sooner your problem is fixed, the sooner you can get back to your schedule. How do I get Automatic Doors Installed? The type of Automatic Door you can have installed really depends on the where it is going to be used. We supply to all types of businesses, from small shops, to large retail units and buildings such as hospitals and offices. We even supply substantial construction projects with large numbers of doors at a time. The process we follow generally remains the same. After an initial site visit we will issue you with a quotation for the work. Once this has been accepted and payment terms agreed, we will be on-site to start at the pre-arranged date. When we get to the site, we identify ourselves and set-up our work area. Generally, we will tape part of the work area off. In an ideal scenario we will have the work area shut off for the duration of the project in order to keep the public safe. For a swing door installation, the time can be anywhere between 4 and 8 hours. We carry everything we need for the installation. The only assistance that we need is an electrical supply feed to the area of work, which we can organise for you. In certain situations, we may require a fire alarm connection as well, however everything else is carried out by Entrance Access Solutions. We can also work on entrances outside of office hours if the project requires it. Please do get in touch with us and let us know your individual requirements. We work on all types of buildings from hospitals, office to shop fronts and security entrances. Please fill out the quote form by following the link below. Generally, we will be able to give you an indicative quotation over the phone, however an accurate quotation will normally require a site visit. What type of door or entrance solution do you require? What type of work are we undertaking (installation, repair, replacement)? What sort of building is the project being undertaken in? What sort of systems and locks do you require? It is important to make sure that your door system is going to be safe and is installed by someone who is qualified to do the work. Entrance Access Solutions Ltd will ensure that your door is installed correctly and complies with the latest health & safety requirements.